I really liked the narration by both Shannon and her birth mother Yuri. They are both told in the 1st person but with a 3rd person's all knowing ways. Shannon couldn't actually remember what it was like to be a tiny infant left on the front steps of a YMCA but somehow you believe and understand every word. There doesn't seem to be a place where Shannon fits. Some of the foster families she is placed with work out for a while, some are downright dangerous. Even when she finds her forever home she feels out of place and in competition with a new sister that doesn't want to share her bedroom or her mother. Shannon's birth mother Yuri is living an ugly life that is largely out of her control. Her father is a depressive mess and her boyfriend is becoming a drug addict. Despite doing everything she can to protect her young son and her unborn baby she makes a poor decision that leads to awful results. Great characters, great story, great ending! I have a feeling that you will be hearing a lot about this book and about this debut author. 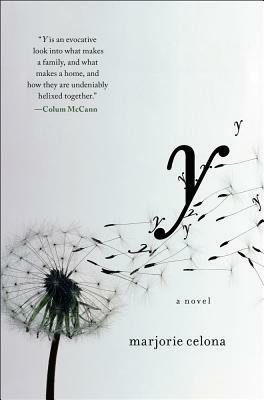 Y has been long listed for the 2012 Scotiabank Giller Prize, Canada’s most distinguished literary prize. Wow, sounds like a really good book, thanks for the review. Without reading this I probably would have passed it up! This sounds like a wonderful book -- I'd never heard of it. Thanks for the great review. I'll be looking out for this novel. It comes out in January in the States. I *believe* that it was released already in Canada. It was such a great read, I can't recommend it enough! Great commentary as usual Jennifer! Your description of this book makes it sound like it could be non - fiction. The world of foster care, people living on the margins, all this entwined with things like drug abuse and depression sounds very realistic. This sounds good! That is what I was thinking while I was reading it Brian, it all rang so true! What a clever title and cover. The novel sounds compelling. Great Review Jennifer! And an amazing title indeed! Thank you, I definitely enjoyed this one! I totally agree on the pretty cover and the clever title! Shannon's and Yuri's tale sound haunting. What constitutes family? And what a home? Those are some of the great questions asked in this book :) I do hope that a lot of people read this one! I'm 75% through the book and don't want it to end. I think Marjorie is utterly brilliant. Not to mention that I have a special place in my heart for her since I used to babysit her when she was about two. I remember thinking, "I wonder what who she's going to be when she grows up." Now I know. My heartiest congratulations to this new author.